Presumably in an effort to capitalize on the recent re-release of The Pink Panther movie series, MGM Home Entertainment delivers a one-disc collection of assorted Pink Panther cartoons. While it is regrettable that these shorts weren’t released in a more complete package, the Pink Panther has never looked better. Containing eight shorts (all of which run between five and seven minutes), Jet Pink doesn’t even bother with a menu and gets right to the cartoons. The first short is entitled “In the Pink of the Night,” and finds our hero sleeping in for an important job. Determined not to miss another day, he decides to purchase a cuckoo clock that’s almost certain to wake him up (the clock actually contains a live bird whose sole purpose for existing is to wake up its owner). The next cartoon, called “Jet Pink,” starts with the Pink Panther on a leisurely stroll, when he passes by a military base and spots a jet sitting on the tarmac. Being the curious cat he is, Panther can’t resist hopping into the pilot’s seat and taking the jet for a ride. 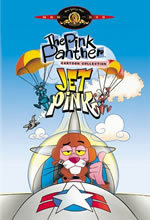 “Jet Pink” features the revelation that not only can the Pink Panther fly, but he can fly as fast as a jet! Episode three, “Little Beaux Pink,” follows the Pink Panther as he attempts to start a little farm that consists of a sole sheep. As luck would have it, an angry and violent cowboy named Tex is upset over Pink’s entrance into his perceived land and begins attacking our hero using a variety of methods that – of course – backfire horribly. Cartoon #4, “Pet Pink Pebbles,” the Pink Panther makes the decision to adopt a pet. Upon arriving at the pet store, Pink is disappointed to learn that ten cents isn’t enough to even buy him a rat. He gets swindled into purchasing a pet rock by a street thief, but is shocked when the rock comes to life and starts following him everywhere. The fifth short, “The Pink Blueprint,” finds Panther battling with a construction worker over the sort of building to be erected. Pink wants a futuristic looking house, while the builder wants a traditional home. High jinks a-plenty ensue. Cartoon #6, called “The Pink Phink,” is similar to the previous short, as it features the Pink Panther fighting with a painter over which color to decorate a house with (Panther wants pink, not surprisingly). The seventh cartoon, entitled “Think Before You Pink,” follows Pink as he attempts to cross the road. Our furry feline is forced to contend with a variety of forces that are seemingly conspiring to prevent him from making it to the other side, and finds himself utilizing sillier and sillier methods for making the simple trek. The last short, “Toro Pink,” finds the Pink Panther as he assumes the role of bullfighter. His opponent is a particularly nasty bull named El Toro, but Pink has a few tricks up his sleeve. Audio: All the cartoons on Jet Pink are presented with a Dolby Digital soundtrack, and it’s effective. Oddly enough, two of the shorts are presented with a laugh track – a distracting addition that’s thankfully absent from the other six. Video: Each of the shorts is presented in full-screen, and they look fine. The lone exception is “Jet Pink,” which is of a substantially worse quality than the rest (the image is faded). Extras: There are no bonus features on the disc, though the DVD does include a booklet that details the Pink Panther’s history. Conclusion: Here’s hoping that this disc is only the first in a long line of Pink Panther DVDs.